Honda’s British Superbike team, with riders Xavi Forés and Andrew Irwin, are heading into the 2019 Bennetts British Superbike Championship season in high spirits, after pre-season testing saw them firmly in the mix aboard the Honda CBR1000RR Fireblade SP2. Wrapping up pre-season testing with an outing at Silverstone last Tuesday, the team has enjoyed a thorough testing schedule both in the UK and also in Europe, which saw the Honda riders consistently running within the front group. During the final test ahead of this weekend’s opening round (19/20/21 April), Forés wasted no time getting to grips with Silverstone’s National circuit. Having never ridden the shorter layout before, the Spaniard headed up the timesheets for most of the day and missed out on a crucial flying lap during the closing moments of the final session, to finish the day ninth. 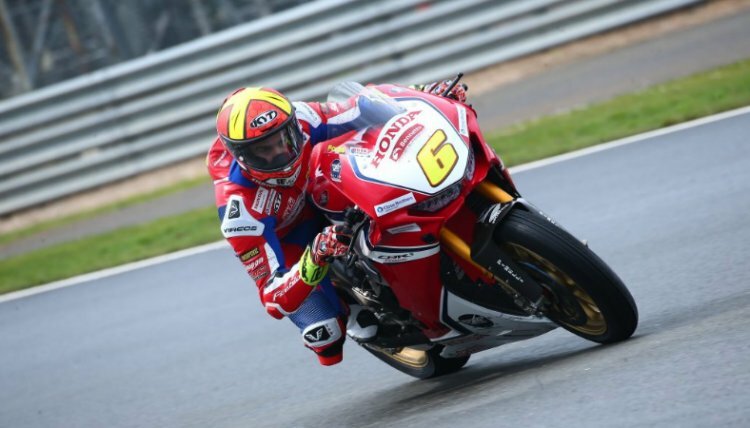 With mixed weather at the 1.6-mile Northamptonshire circuit, Irwin gelled with the Fireblade in the conditions, staying within the top-six throughout each session. Finishing the day sixth, Irwin was 0.399 seconds from the front. The team’s National Superstock 1000 Championship contender Tom Neave also thrived in the intermittent conditions to finish the day seventh, just 0.727 seconds behind. The opening round of the 2019 Bennetts British Superbike Championship takes place this Easter weekend, with First Practice on Friday (19 April) at 10.20, with Race 1 scheduled for Sunday (21 April) at 13.30 and Race 2 at 16.30. Finally it’s Round 1 this weekend it feels like it has been a very long winter! We had a very good final test at Silverstone last week and we have made a great improvement with the Fireblade. The last time I rode Silverstone was 2011, but it was on the GP circuit, so I had some time to adjust to the shorter layout. At the start I was missing some reference points with braking and getting on the gas, but towards the end of the day we had improved and were constantly on the pace. During the final session I went out on a new tyre and was doing a flying lap, but had a big highside and nearly crashed, so I decided to finish the day and not risk anything a week before the race. The Fireblade is working really well and I know we have a good base setting for the race weekend. A huge thanks to the team for all their hard work getting us to where we are now, I am looking forward to my first BSB race and can’t wait to experience the weekend. Testing is done and dusted now and it’s almost a sigh of relief, as you know that racing is around the corner! I feel we’re in a good position and we know what direction we need to keep working in to keep improving. I said all along if we’re around the top-six I’m happy as the Showdown is my target, and we wrapped up testing sixth – so I can’t complain. Of course, you’re never delighted with sixth don’t get me wrong, but this is testing and it’s not always about where you finish, as that’s down to racing! The team has done a great job, along with Xavi to bring the Fireblade to where we are now, which is a step in the right direction. I feel we’ve done as much as we can now and I’m happy and looking forward to Silverstone Round 1. I feel really happy with how the testing schedule has gone, I’ve had a lot of bike time heading into the season and feeling really comfortable with the Fireblade. We’ve had two tests at Silverstone and in both we’ve been consistent and I feel at home now with the Honda and ready to race. During the final test we had mixed weather and I was dreading going out as I’ve not had much wet riding, but I’m pleased with how it went and feel I’m ready to race the Fireblade in whatever conditions are thrown at us now. I can’t wait to get to Silverstone this weekend and see how we get on. I think we’re as ready as we can be for Round 1, the team and the riders are all looking forward to the opening round at Silverstone. It’s been a long time since the end of the season, but we’ve had great tests over winter and we’re ready for the season. Testing was positive for us and we were very lucky with the weather in Spain and Portugal, which spoilt us a bit when we came back to the UK. But we managed to get good settings and settle Xavi and Andrew with the Fireblade, which is important, as it’s a new machine for both of them. I am very pleased with the progress made and think we’re in a good position for the opening round and can’t wait to get the season underway.